ISLAMABAD (92 News) – Former defence minister and PML-N’s parliamentarian Khurram Dastgir said that the Pakistan Muslim League-N (PML-N) will record protest over the government’s poor enemy policies. Speaking to the journalists, the PML-N leader said that the illegal roof of Bani Gala should be demolished instead of the poor houses. “One after another mini-budjet is presented, the rulers are pushing the country back towards past in the new year,” he said. The PML-N stalwart said that the Joint Investigation Report (JIT) on fake accounts scam has been leaked out for political purpose. He said Prime Minister Imran Khan upholds the interior ministry, as well so how is possible that he would be unaware of the situation. The JIT report was intentionally leaked by the government for political purpose, he added. Dastgir said it was Pakistan Tehreek-e-Insaf (PTI) who was maligning political opponents on Asghar Khan case for 26 years now asking for closure of the case. He informed that the joint meeting of the opposition parties would be held after two days. 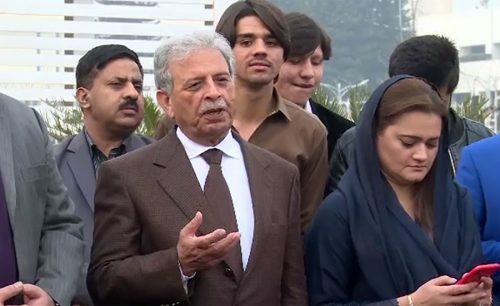 He further said that using delaying tactics in complete medical checkup of Shahbaz Sharif, and Imran Khan is victimizing their political rivals.